Sometimes we fall in love at first sight, others it takes time to appreciate something or somebody; some other times we see somebody and we just disregard it, to discover few hours later that we like it instead. That is what happened to me with Mexico City. It has worldwide a bad reputation, that I am sure it will not last long anymore, but it is true that it is known for being polluted, trafficated, corrupted and even ugly. A scary city where walking alone can be often a problem and not recommendable. I feel so lucky to be here now writing about this amazing city; it enchanted me and that is probably why I am still here after 40 days instead of couple of weeks, among the not so many young foreigners to have decided to discover a little bit more the Mexican capital. I have been here few days last month before to start my adventurous trip through the country, passing by Puebla, Oaxaca, Mazunte, Puerto Escondido, San Cristobal de las casas, Palenque, Tulum, Playa del Carmen and Isla Mujeres. I enjoyed the tour so much and every day I was kind of falling more and more in love with the culture and the places I was seeing. I think that Mexico has it all: a megalopolis offering all kind of leisure every big city in the globe offers, stunning white sand beaches with turquoise Caribbean seas, waved oceans, mountains, hills, unique waterfalls; crazy nightlife, music, art and literature; innumerable arqueological sites, thousand years of history and civilization. 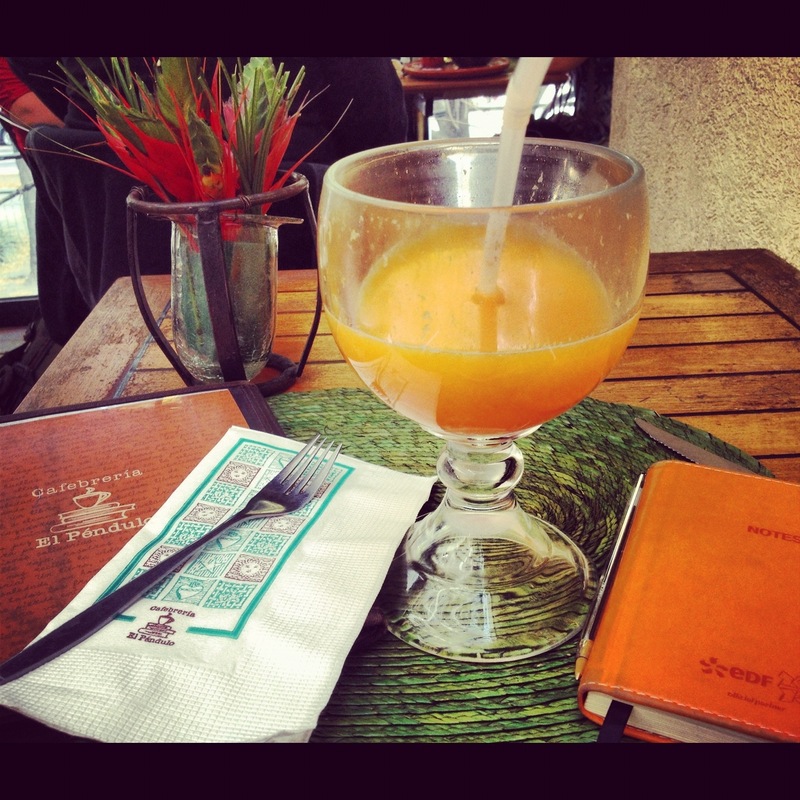 Yummy food and exquisite drinks. 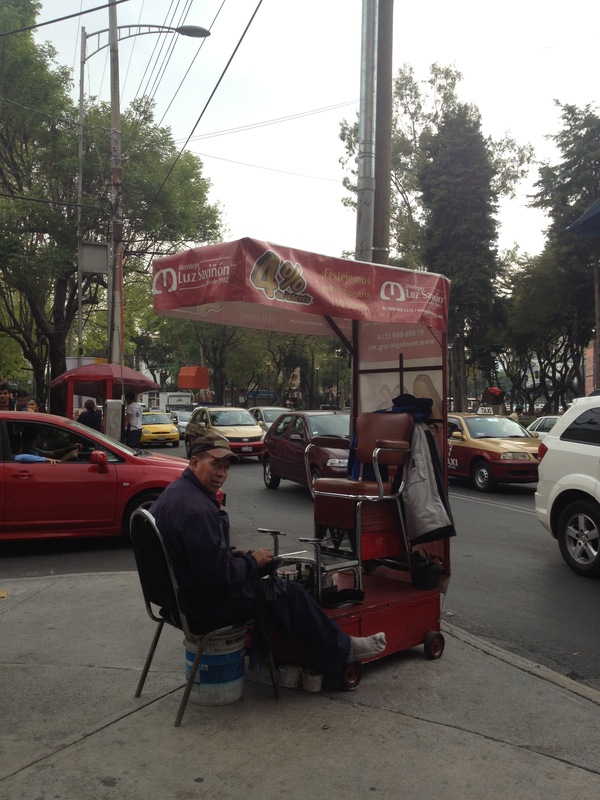 And this is why I felt the need to go back to Mexico City and have a break from the continuous movings and changes. I needed some rest; some home feeling and I knew for sure that I would have found it here. 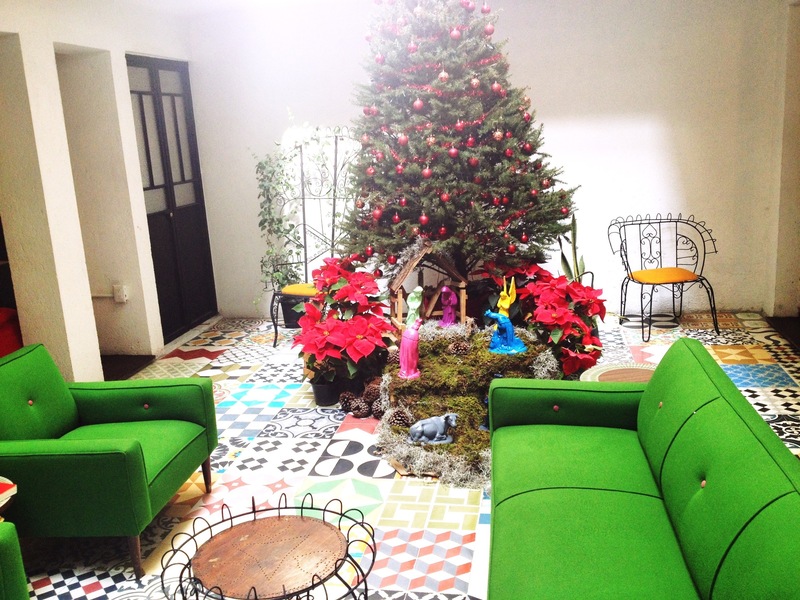 Of course I came back to my favorite place ever in Colonia Condesa at the Stayinn Barefoot hostel. I found it even more beautiful than when I left it about a month ago, this time decorated with a lovely Christmas tree with multicolored figures of the holy crèche replacing the skulls and Day of death adornment. 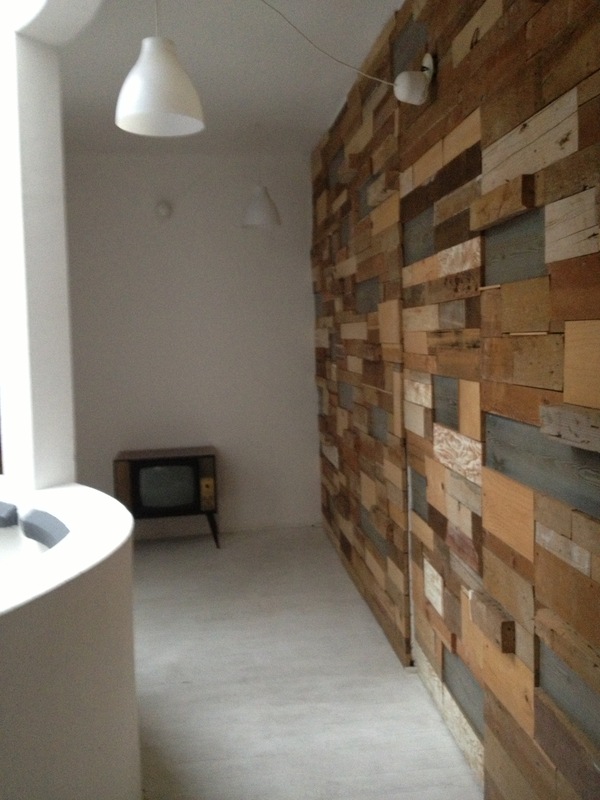 Plus, it has now opened a cozy little bistro where also people not accommodated at the hostel can eat. And there is a new entry: Carlos, an anti-Mexican prototype – 1.92 tall guy who you would bet that comes from Bergen or Goteborg, who would cook exquisite food inspired from the different countries he has lived in as a chef. Furthermore, just beside the bistro inside the hostel they are opening a “mezcaleria”, or canteen, and the roof terrace is going to be soon a hangout place with a cool bar, all opened to the public. 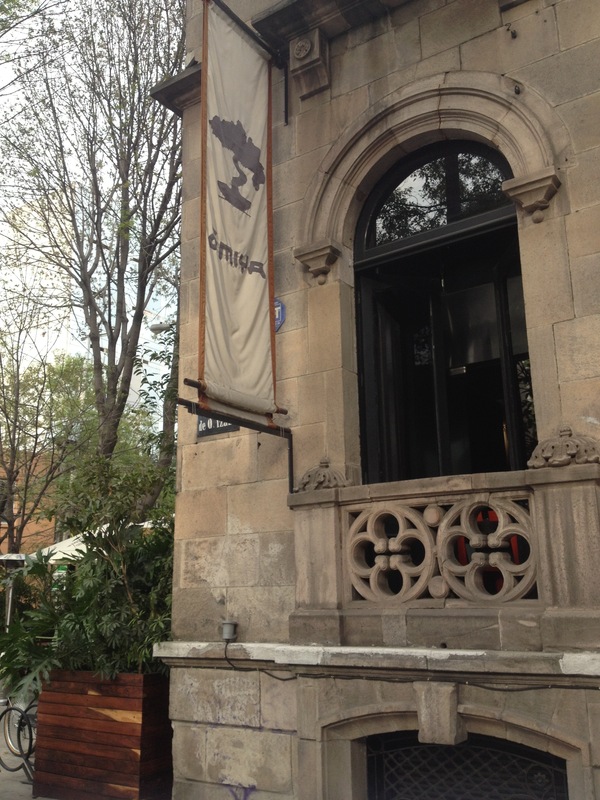 If before I was loving this place, now I seriously find it unique and a must see place where to stay when in Mexico City. 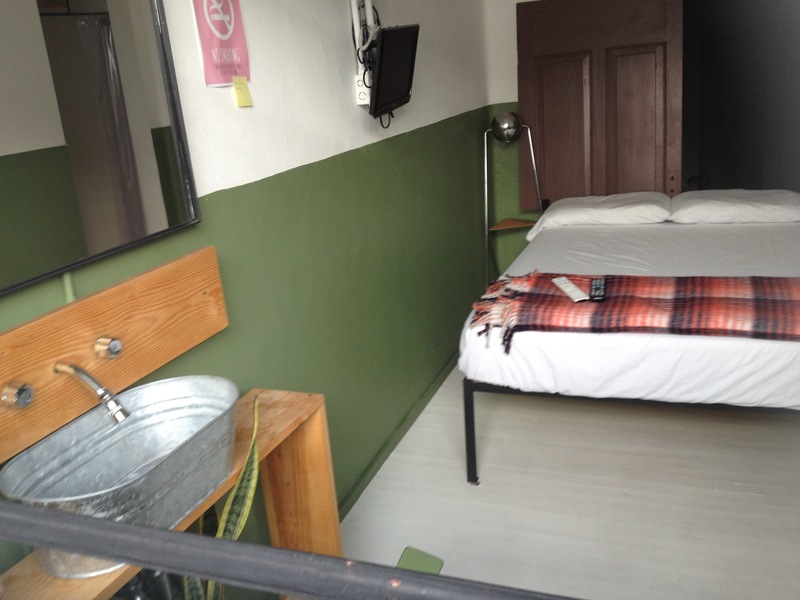 It is still a hostel, with an excellent location and service but of course limited facilities not being a proper hotel. But I wish you all would come here once. 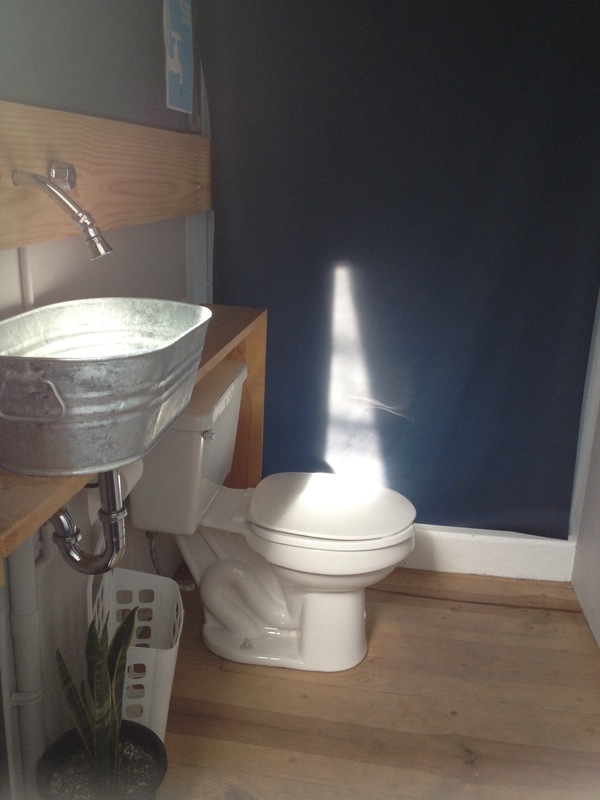 There are spacious dorms with 6 comfortable beds and stylish, simple and shared bathrooms, but there are also private bedrooms for those who might be skeptical towards sharing. I was welcomed again from the pretty smile of the two guys at the reception: Delphine and Enrique, it was nice to see them again and tell them all sort of stories lived during this month travelling and sharing with them my increased love for Mexico. I visited marvelous places and met gorgeous people, but DF was calling, and I could not resist taking the first flight from Cancun and coming back. Even if there was a “colder” weather here, I still wanted to move from a beach paradise to this crazy busy city. It is like with people. You might meet and like different ones, but normally there is one who deserves a place in your heart, no matter if it was just an adventure, that feeling exist, and you have to follow the instinct. Shame for those who live not expressing themselves for fear or for thinking not to be able to love or deserve to be loved. It makes me think now of a beautiful song from Morcheeba – ” Fear and Love: Fear can stop you loving, love can stop your fear”. If I would have continued to be fearful towards DF I wouldn’t have loved it the way I do now, and since I love it, I am enjoying it with no fear. It is still risky but worth it. I am not convinced that the way I am is the best one, I am a big romantic and an endless dreamer, and if I like something or somebody I will not hide it. So, Even though I had “met ” DF at the beginning of my Mexican trip, I had been faithful to her somehow in the heart and although the other places were amazing, none of them had really given me that little fluttery feeling in the stomach. So, referring to cities, DF made me want to return, and like a Gotan Project song says: “vuelvo al sur como se vuelve siempre al amor” and here I am, back and happy. I found the city even more beautiful, I had left it one month ago in a rush because I was excited to see new places but also because it was rainy and cold. Luckily I found a warm December here, with an average temperature of 20 degrees. Awesome. This time I felt much more confident walking on my own, I remember my first night here when I was inexplicably frightened even to be smoking alone outside a building door. With this I don’t want to say that it is the safest city in the world, but it is like major big cities with good and bad aspects, where it is true that you can hear story somebody who has been robbed or assaulted, which is horrific. But I have been walking alone even at night, always watching out and careful, but in the end it is definitely not that scary. Come on, yes, it has bad reputation because it is not that unusual to be robbed there but that not happen everywhere, there are certain areas to avoid, a little common sense and codes to be respected; but if you never try you will never know that it is one of the most beautiful cities with a heartbreaking views on the sea from nearly wherever in the city. We have to give chances to the places and to the people, as well as to the movies for example. Has it ever happen to go to the cinema to watch a movie everybody told you not to or vice versa, but once you go out from the hall you find it just the opposite of how the others has described it? It worth’s a try in this life, it worth to make some effort sometimes. It worth to live it with no fear, you might not regret about it. Sometimes can happen that you change your mind. That for example you are in a bad mood and watch a movie finding it ugly. Then after few years you see it again with the lovely company of a friend or partner and you find it amazing, like it was another movie. It happened many times to me. And I am sure that it happens when we visit places. We might love a place more than the usual because we found an amazing sun shining instead of a cloudy grey sky. We might have fun at a party even if the venue is crap, but you talk with somebody who makes your night more pleasant. It is the case of what happened on my birthday in Patzcuaro, I had an amazing fun time in this little hidden corner of the earth and had more fun than the one I had in the fanciest club in New York few weeks before. Most of us have probably travelled a lot, seen many things; most of us live in beautiful countries, our eyes and our heart is used to beauty, but we keep looking for genuine, real things, places and people who have a soul and emotion us. And we find a compatible soul only rarely. That is why we should catch it when it happens, and always listen to the heart. I am probably turning too romantic now and as always lengthy. So I would like to go back to my love for Mexico City especially of my favorite areas, Colonia Roma and Colonia Condesa. This morning I prepared a nice playlist on my iPhone, I walked on Juan Escutia, then Mazatlan, turned on Michoacán where I could see appealing bars and restaurants that made me want to stop to any of them. But this time I was not just wandering around, but actually looking for a specific place that had been recommended me by Carla, one of the five young guys who run the Stayinn Barefoot Hostel. 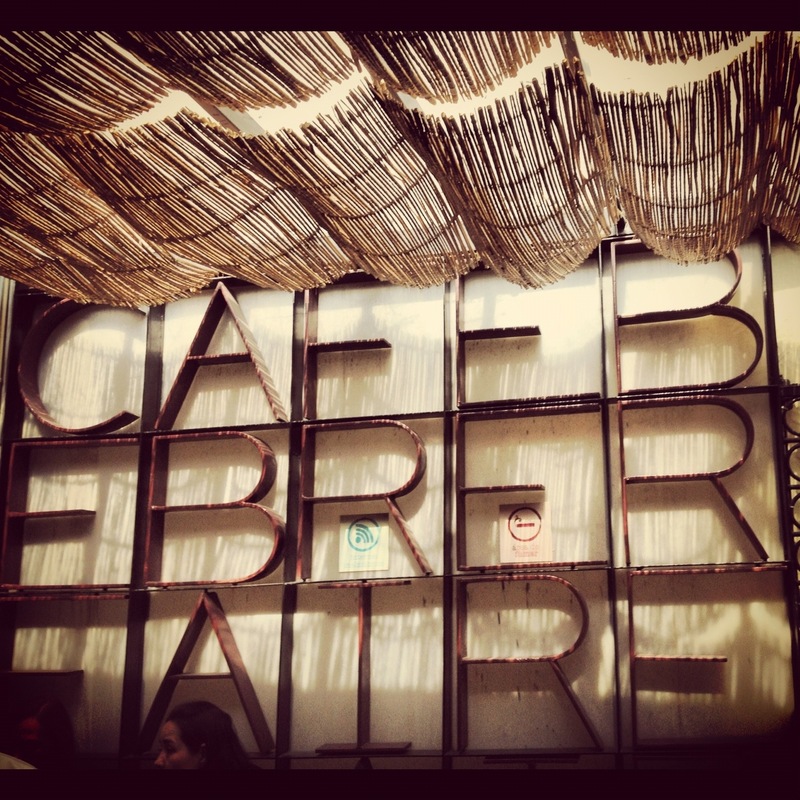 I had asked her a local tip on a cozy cafe where to chill, have some drink or food, and she suggested a place that through its description sounded like similar to my favorite place in Puerto Escondido, Casa Babylon. 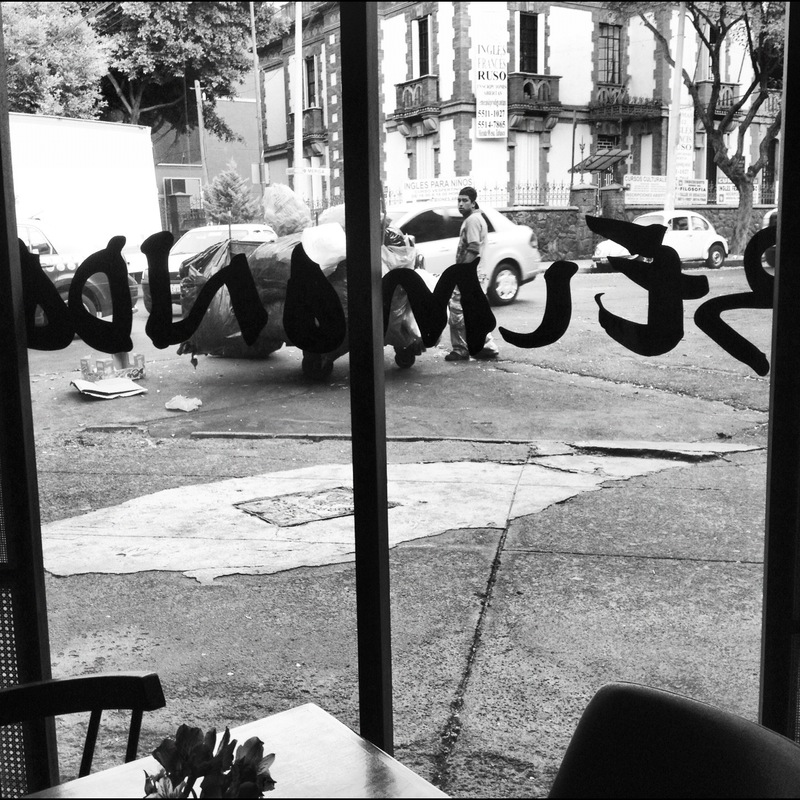 But this one in Mexico City was named “El pendulo” defined as a cafebreria, a mixed word between cafeteria and libreria, bookshop in Spanish. 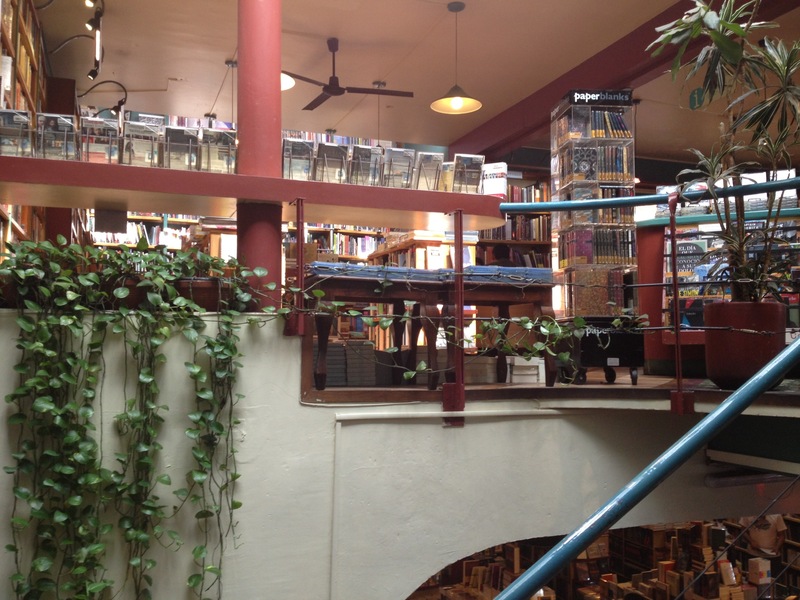 Thousands of books spread on shelves and counters on two levels, with homey and comfy armchairs and smiley “meseros”, waiters in Spanish, welcoming you and giving you great service. The menu is wise: has a vegetarian and light option, with vegetable crepes with cheese and tamarind sauce. Then soups, salads, sandwiches, gyros, strawberries Shiva lassies, espresso cafes and juices. The menu offer pasta, with a “lassagna” in the list, which was not really appealing just for the fact that it was misspelled. Come on chef, even if you are not Italian you might have noticed the error! For lunch there is a 140 pesos (about 10 us dollars) daily fix menu with 3 different options to be chosen, a fresh water of the day and a cafe. Good deal. I had just delighted a breakfast at the hostel so I only ordered a cafe and a delicious “narahoria” juice, a mix of orange (nara- nja) and carrot (zana-horia) juice. Fresh and savory. I loved that cool place, I relaxed and enjoyed it, I wrote few lines on my EDF orange notebook, given me as a gift on my last day working at the Olympics, and I really care for it. After “El Pendulo” I walked few meters to reach a place specialized in filled baked potatoes. You might not all know that it is among my favorite meals, and I really wanted to try it. I went to a little bistro called “Papa rellena” just off Nuevo Leon, and ordered a potato filled with Gouda cheese and beef. The filling was really tasty. Such a shame that the potato was too hard and not really good. I prefer it when it is so soft that you can eat it with a teaspoon. Nuevo Leon is a street full of fancy bars, bakeries and restaurants, and accidentally came across Bonito, a place I had been for a nice dinner last month; I took a look at it, had a nice memory but I proceeded the walk. 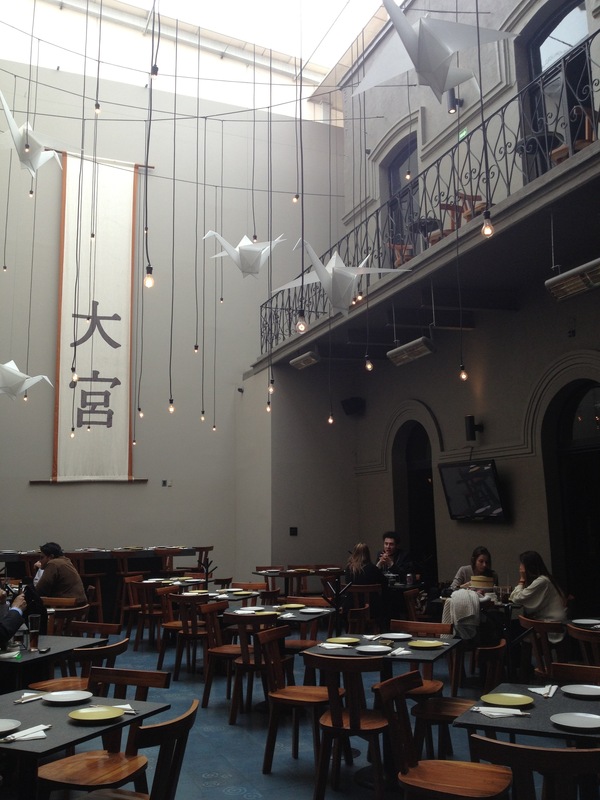 I spotted a trendy restaurant called “la Capital”, I was captivated by its design and good ambience. I might have to go and verify the reliability of my first nice feeling on it. While walking Parque Espana I saw a funny vintage car parked outside a fancy boutique hotel called Condesa DF. I walked in and saw a nice restaurant in a whitey patio with warm colors; I also visited the sushi bar situated on the roof terrace decorated with green and white modern furniture and offering the guests nice views. Apparently on Sundays there is a dj playing until late. I left the hotel and continued my walk. I stopped in the front of a nice French bakery called La Balance with succulent products displayed, just to take a look at the route and look for Colima, a street I had walked last time and I had liked it a lot. It was just few minutes from there, I saw one of the popular men who polish shoes in the street corner, and it was nice to notice that he was barefoot and was cleaning his own shoes. 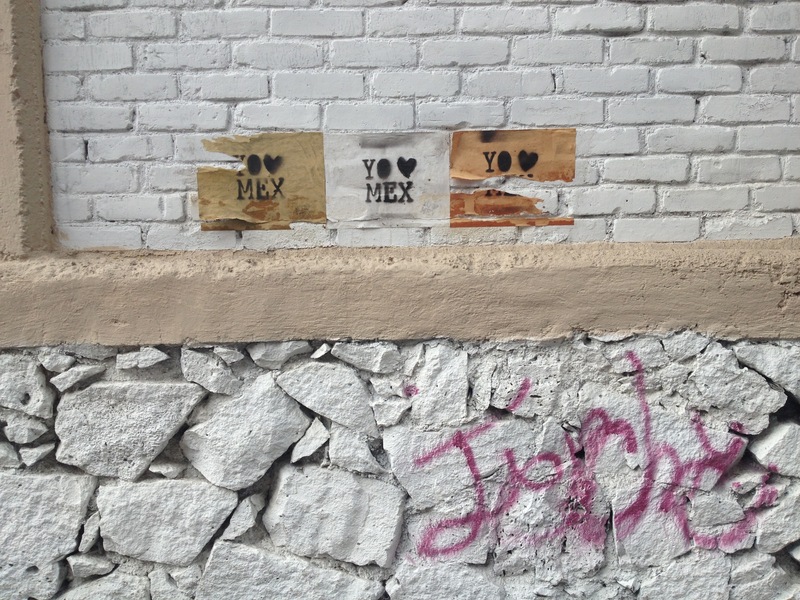 I walked a big part of Colima Street, finding on the pavement a lovely graffiti “I love Mex”. I took a very cool picture with my red all-star matching the red heart. 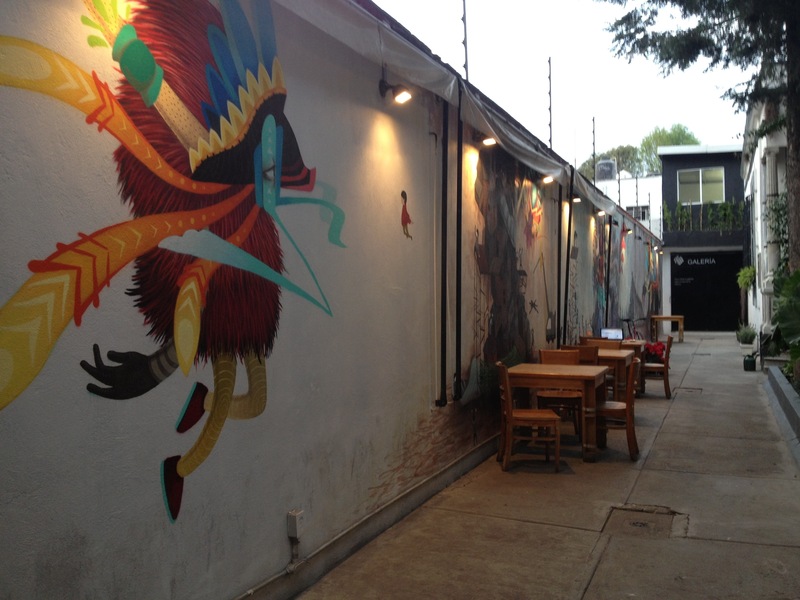 Colima has trendy clothing, design and antique shops and restaurants, and actually I stopped by an Asiatic restaurant called Omiya, mainly Japanese and fusion food. It had really high ceilings decorated in a tangible Asiatic style. I might want to go there as well before to leave. 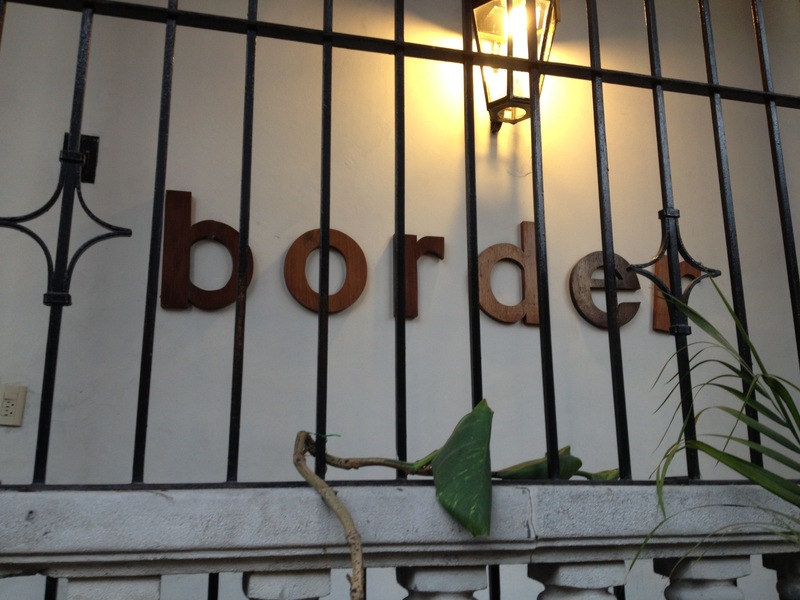 Another spot I wanted to see in Colonia Roma was a gallery called Border: I had read nice things about it so while getting to Zacatecas street I came across another familiar place: Belmondo, a lovely sophisticated cafeteria and restaurant I had been last month, when I enjoyed a corn cake and a superior cafe. I could not avoid stopping again. It was disappointing to figure out that Border had no exhibition at the moment and that wouldn’t have any until February, but the space itself looked cool. On the way back to the hostel I remembered that at Palacio de Hierro, a popular Mexican department store last time I had noticed a nice Spanish delicatessen. 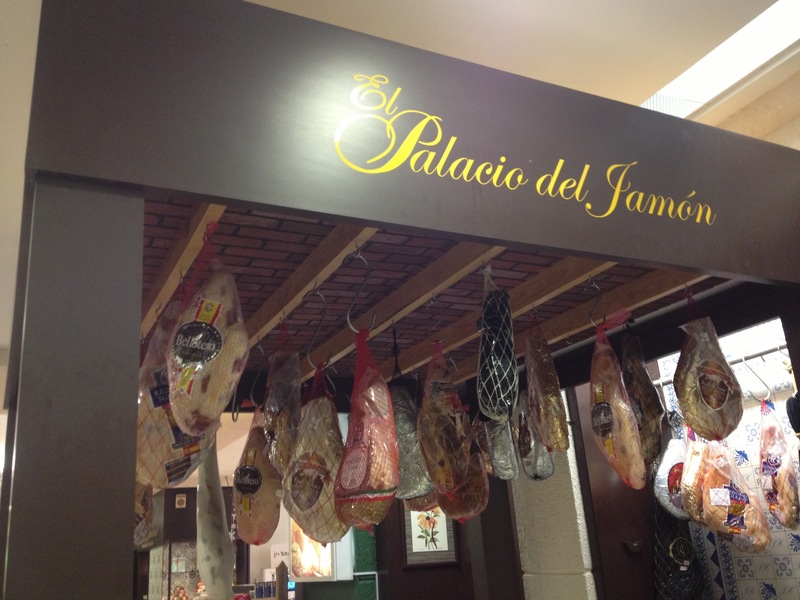 I was craving familiar tastes and I bought some Jamon Serrano and provolone cheese. Spain and Italy together better than ever, also among my favorite food combinations. 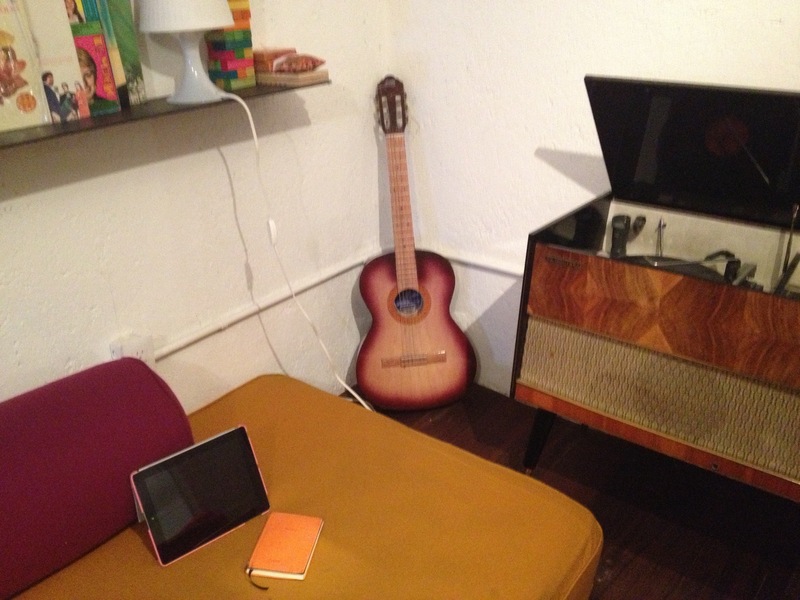 And here I am, exhausted, on the colorful stylish sofas at the hostel, surrounded by vinyl, a small guitar and a vintage LP player. Delphine is reading a book, speaking with people and whenever she laughs I love it, it is so hilarious and contagious: it makes me laugh even if I don’t know why she does. Enrique just arrived to swap the shift with Delphine, they are now laughing together for some funny reason. They are lovely! Thanks so much for linking my post to this one! I’m glad you enjoyed and fell in love with DF – it really is a gem, isn’t it? 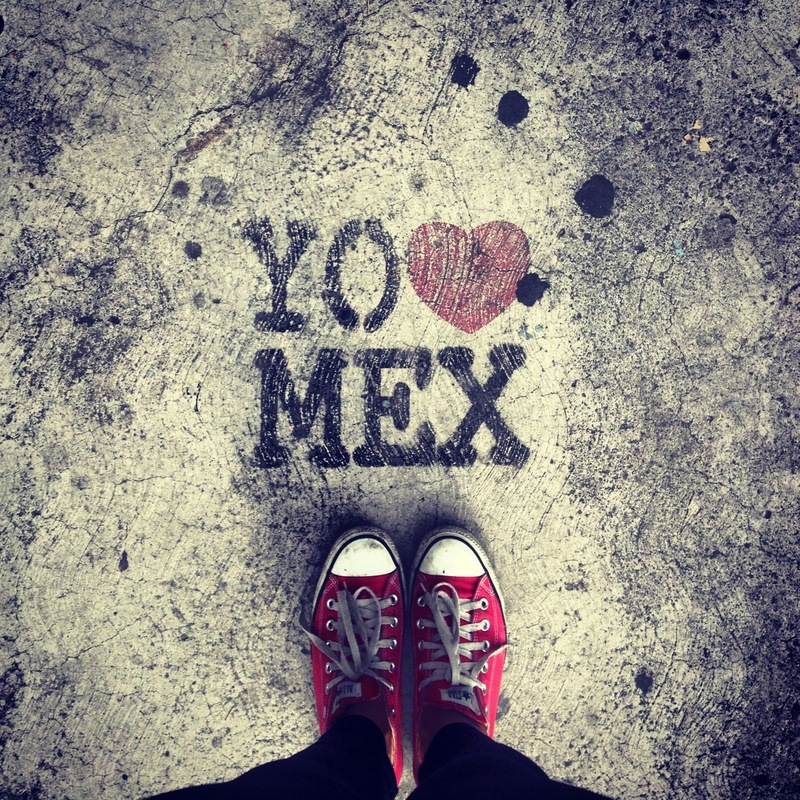 Also, I absolutely LOVE the photo of your shoes and the Yo ❤ Mexico graffiti! Thank you! 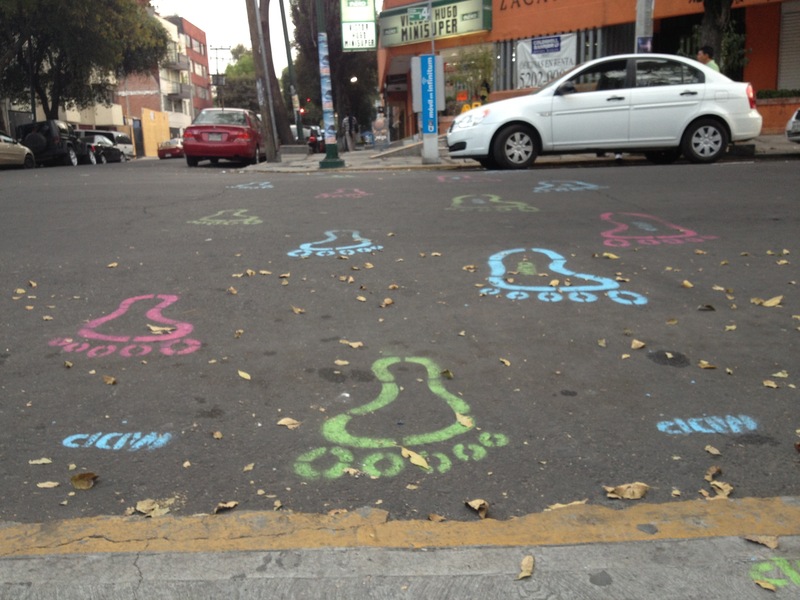 It was in calle Colima, in Roma area, I also loved it! Thank you katiemarti! Indeed, D.F. is a gem, the most unexpected gem, and a great surprise for most of the people who visit it! !